Dannion and Kathryn Brinkley offer inspired and practical insights for those who want to enrich their individual life in a way that benefits not only themselves, but uplifts the entire planet.--Michael Bernard Beckwith, author of "Spiritual Liberation." In 1975, Dannion Brinkley was struck and killed by lightning. When he awoke in a morgue twenty-eight minutes later, everything was forever changed. During the next twenty years, Brinkley had not one, but two more near-death experiences. Each time, he visited the other side and received valuable lessons and spiritual knowledge, which he incorporated into his daily life. 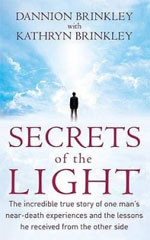 Now, in Secrets of the Light, he shares the lessons he learned in the afterlife so we, too, can fulfil our true purpose in life. Brinkley outlines the 'Four-Fold Path to Power' - Love, Choice, Belief, and Prayer - that will empower you to follow your destiny. He then unveils the Seven Truths from the afterlife and how to use them to enhance health, happiness, and prosperity. We also learn how to perform a 'daily life review' - a quick assessment of your daily life that acts as a reminder to stay true to yourself and treat others with kindness. With wit, humor, and compassion, Brinkley shows that by always being conscious of your actions and how they affect others, you will find happiness in this life and beyond.